We can design any style of NCR pad, no matter what shape, size or format and create each design completely bespoke and tailored to your specific requirements. If you have an idea in mind or an existing form that needs updating we will happily work from that or alternatively advise you on the best layout and structure depending upon your requirements. NCR pads can be a useful aid for a variety of applications including order forms, invoices, quotation forms, receipt pads and any other document where more that one copy is needed or would be useful. Your creative and corporate NCR pad designer will talk in-depth about your requirements, taking into account any ideas you may have. Your NCR pad designer will begin work on your NCR form design and email you the letterhead concept board within 48 hours. Once you have viewed the initial concept you may discuss any changes with your NCR pad designer and he/she will continue to revise your NCR pad design until you are happy (unlimited revisions). 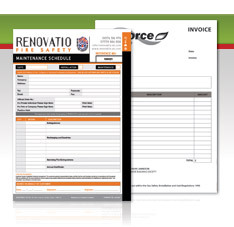 Once you have signed off the NCR pad design, your NCR form designer will prepare for either print or send. If you have selected printing, your letterhead will be printed and sent to you. If you have selected design only, your final NCR pad design will be prepared in high resolution print ready format and emailed to you.